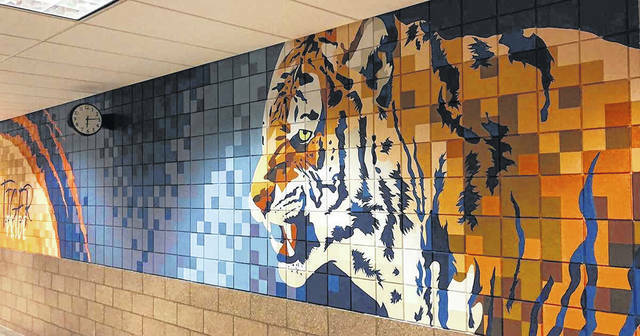 GALION — The Galion City School District Board of Education recognized a group of volunteers who gave their time during the summer to add a splash of color to the walls of the Galion Middle School. At this week’s school board meeting, Curt Wiggins and his wife Amanda Wiggins, Cindy Glew, Elizabeth Ice , Gina Redman, Rachel Gangwer, Shelly Barton and Mandy Kent were recognized for their work in improving the looks of the interior of the Middle School. During the personnel portion of the meeting, the board approved Mrs. Regina Jutz as executive secretary/EMIS Coordinator. She moves to the central office after serving at Galion Middle School the past two years. The board also accepted the resignation for the purpose of retirement from Mrs. Pamela Hayes. The long-time elementary school teacher will retire effective May 31, 2019. The board approved the DARE program for sixth graders for the 2018-19 school year during the business portion of the agenda. A resolution was also approved for the district to become a member of the Crawford County Business & Education Advisory Council (CCBEAC), with Grubbs serving as the district’s representative. Inside: Galion Building and Loan honored for providing calculators for Galion students since 1992.